The Sunny South and the Wet West. 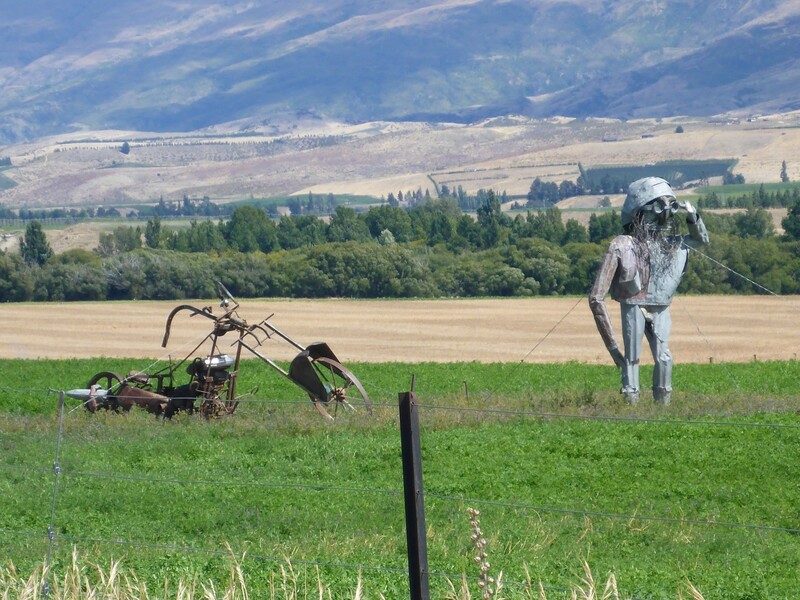 Invercargill, South Island, NZ. 15th February 2015. If ever evidence was needed that many immigrants to NZ came from Scotland, then a tour round the southern half of the south island would provide it. I’d just left Dunedin and was heading to Invercargill. 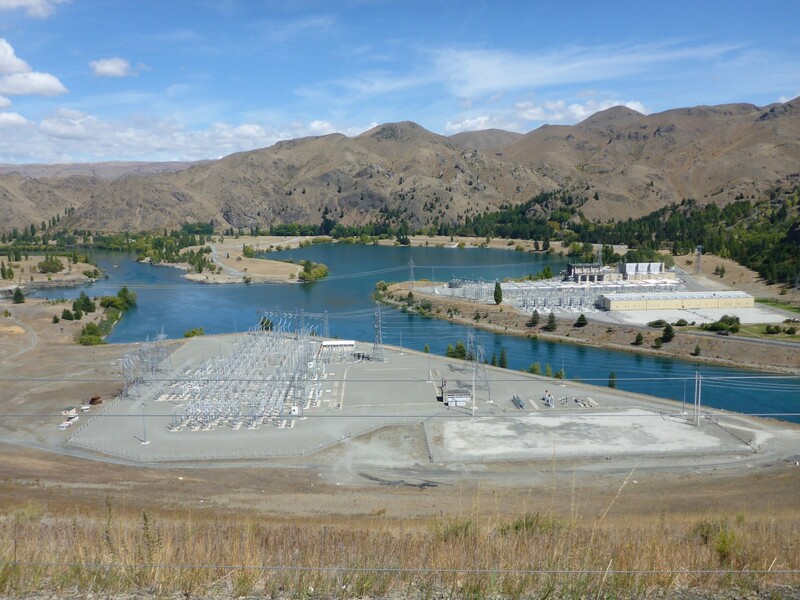 Other towns in the area include Balclutha, Clyde, Roxburgh, Bannockburn and Glenorchy. As Scottish as it gets. There’s even a Wallacetown. No predators equals large, flightless birds. Some might wonder where the attraction lay in emigrating to the other side of the world, with the attendant hardships, distance from family and rigours of starting afresh in an unknown land. But any study of mid nineteenth century Britain would reveal how difficult life was for ordinary people. No vote, no land, no say, oppressive factory owners and landlords. Plentiful poverty and no hope, in other words. Once the attraction of subsidised passage was thrown in, it was no surprise that people from all over the British Isles were prepared to take a chance in the new colonies. Some failed and perhaps returned home, but most prospered and became successful citizens with land of their own and hope for the future. For these people, New Zealand rocked! I had another nice ride down through the Catlins, following the scenic coast road. Stopping for a coffee, I met a German cycling couple who had travelled in various countries, usually buying bikes when they arrived. They’d bought a motorbike in Vietnam and then sold it before they left, losing US$150 in the process. That struck me as a very reasonable cost for transporting two people. Food for thought as Vietnam doesn’t allow bikes over 250cc to be brought in. Before going into Invercargill to find my hostel I turned south and rode down to Bluff, NZ’s most southerly mainland town. 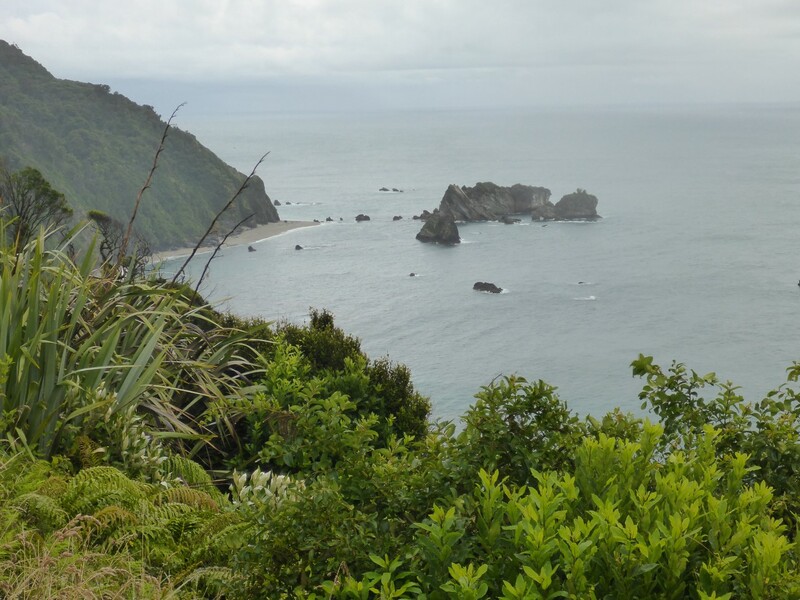 There was a lookout hill to ride up and explore, with plenty of tourist information, especially regarding Maori activities. 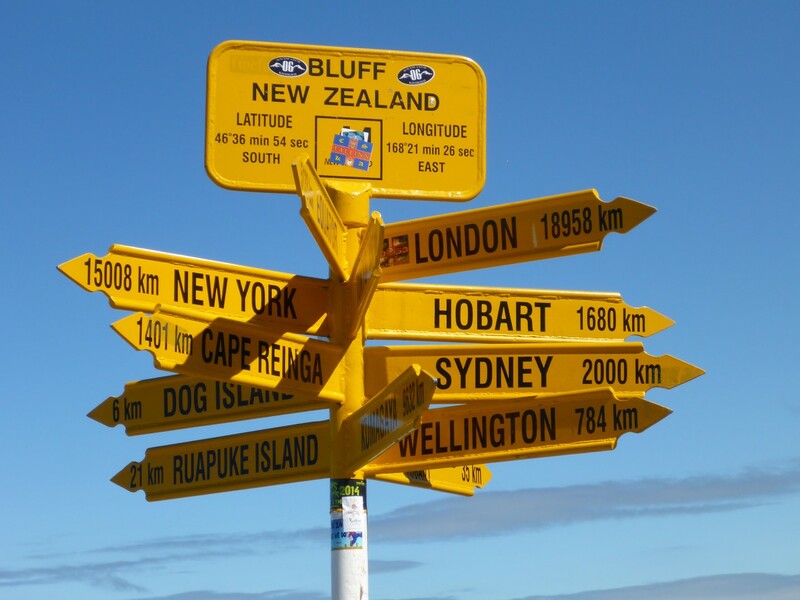 Down at Stirling Point, I found the usual tourist signpost, telling people how far away they are from home, and chatted to a few bikers there too. 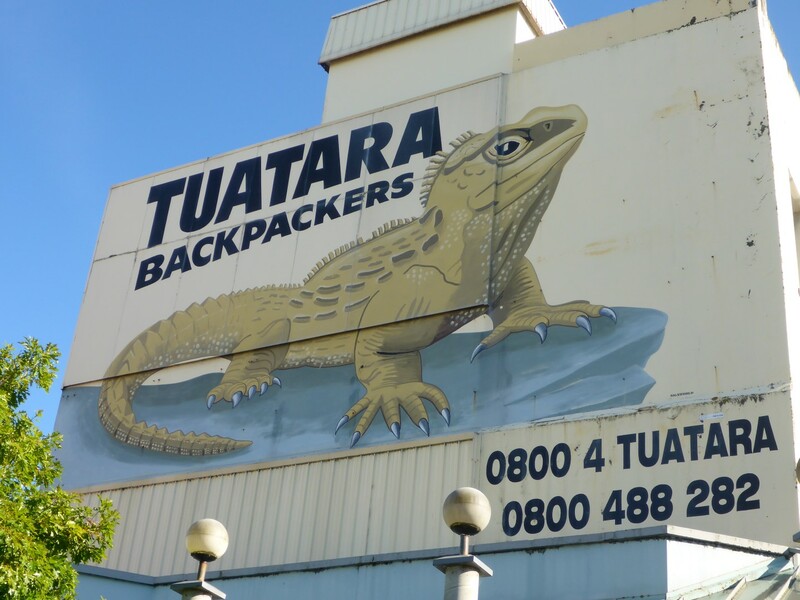 Tuatara Backpackers is named after a NZ animal which is one of those odd creatures that evolution throws up. It is partway between a lizard and a bird, having feathers along its back. As the picture makes obvious, there is no pretence at any ability to fly. Regardless, the hostel helped secure my bike to the ground by allowing me to put it in their locked up back yard. Settled in, I went for a walk, wanting to check out a certain hardware store. Innocuous looking home for a famous record breaker. Next morning I walked up the street to Hayes Hardware and checked with a guy on the till if it was OK to wander around. Tins of paint? Pots of them. Wheelbarrows? Shedloads. Screws and nails? More than you could shake a broomstick at. But I wasn’t interested in any of these. I was hunting the World’s Fastest Indian! No, not Running Bear, but Bert Munro’s 1926 Indian Scout. 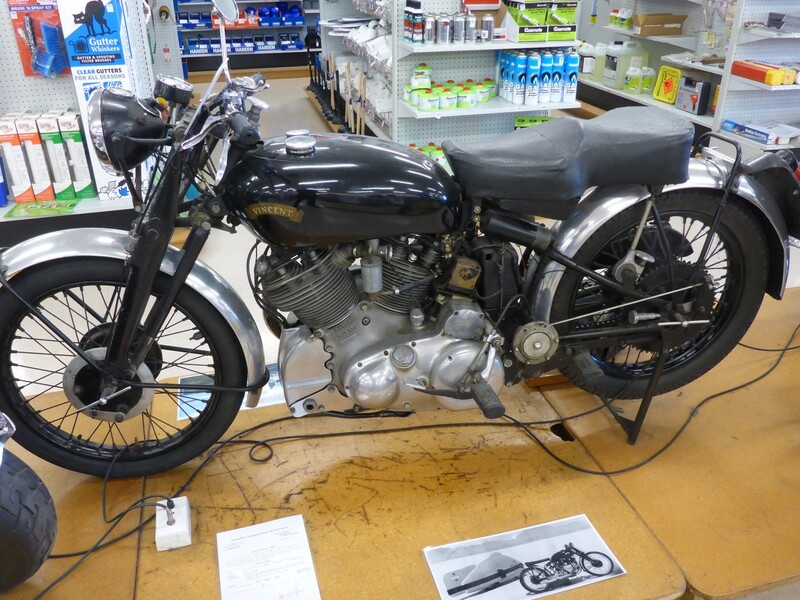 Bought as a 600cc, 55mph road bike in 1926, by 1967 it was a 950cc, 184mph record breaker. He didn’t have much money and made many of the parts himself. He went to the Bonneville Salt Flats ten times and took his Indian with him nine of them. He set records in 1962, 1966 and finally in 1967. One of the records still stands today. 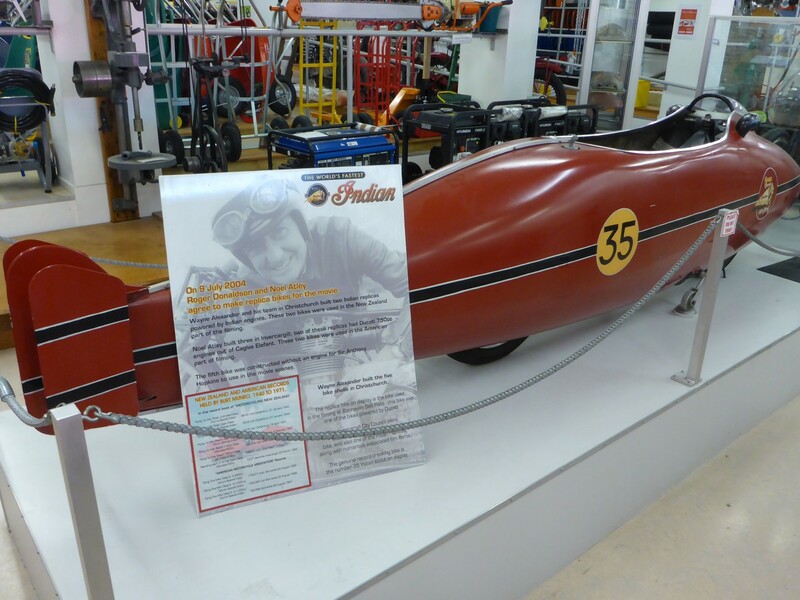 He had very little recognition until the film, The World’s Fastest Indian, came out in 2005, particularly outside of NZ.. 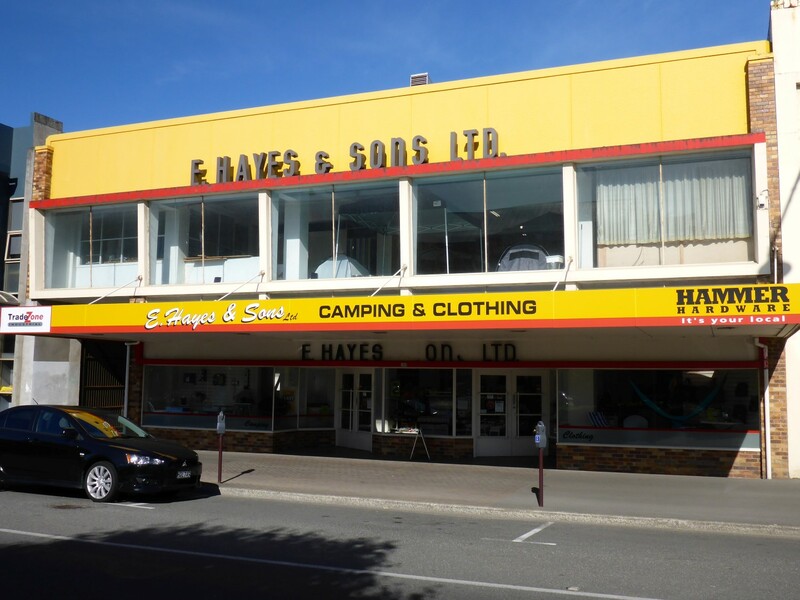 He died in 1978, aged 78, but before he did he sold all his bikes and spares to his friend Ernie Hayes on the condition that they were not to leave Invercargill. In 2014 the Indian Motorcycle Company named a special bike after him, The Spirit of Munro, and the American Motorcycle Association inducted him into their Hall of Fame in 2006. Super fast Indian Scout; Velocette MSS alongside. Methanol in, exhaust gas out equals MPH in abundance. 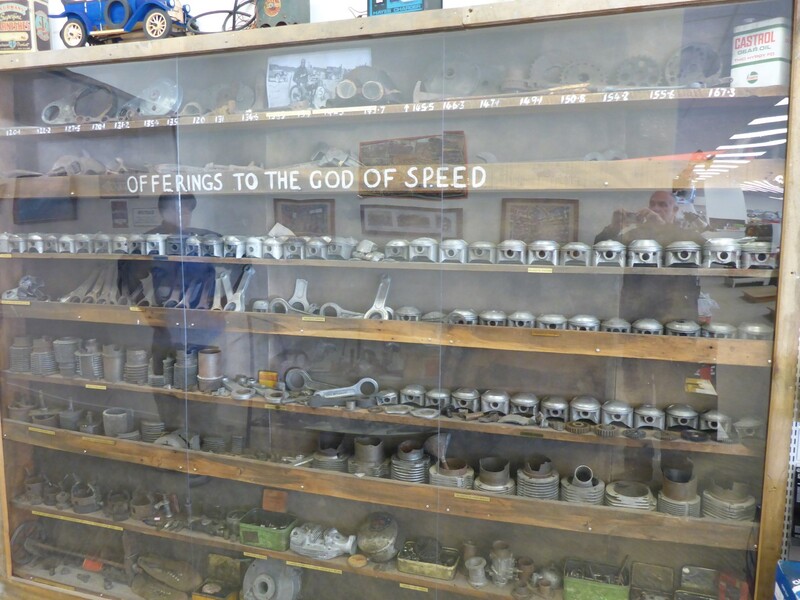 ‘Offerings to the God of Speed. Mostly hand made spare parts. 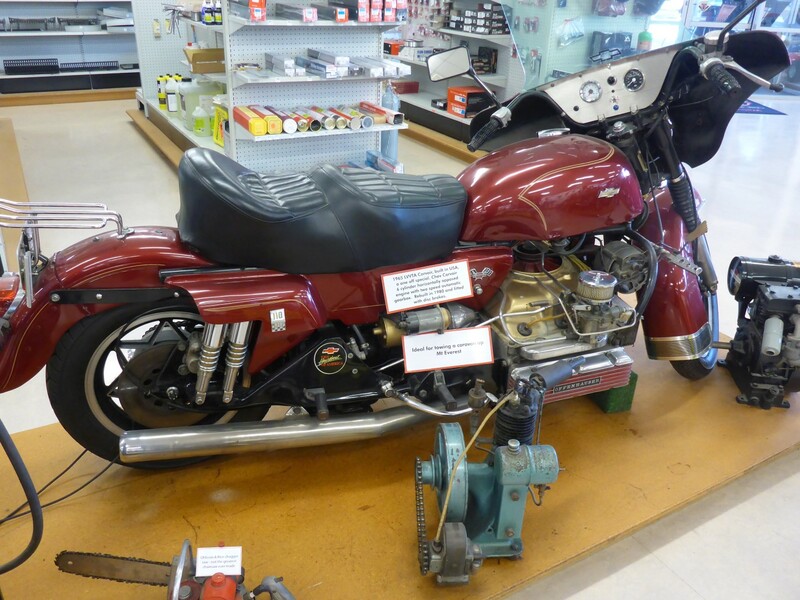 His Indian Scout, and his similarly modified 1936 racing Velocette MSS, sit in the store surrounded by the mundane items in which hardware stores specialise. But they’re not alone. 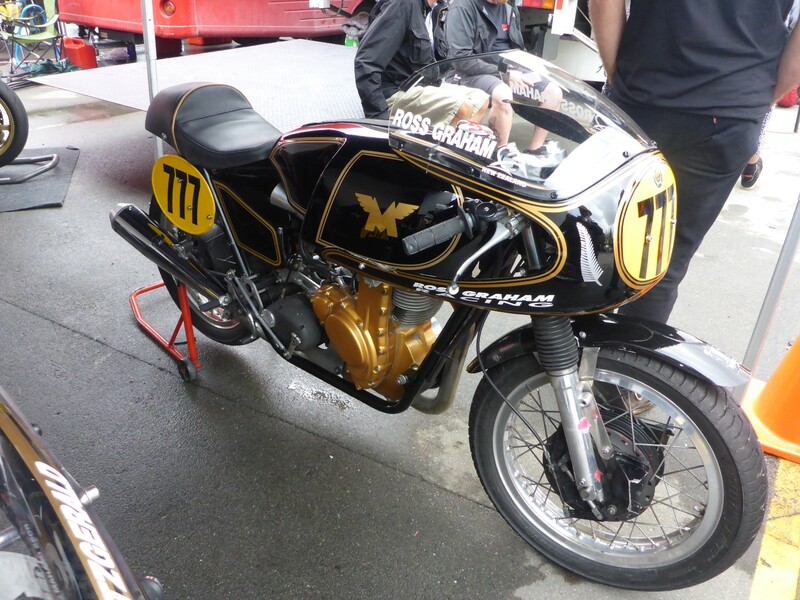 The Hayes family are keen motorcyclists and have raced and collected many bikes over the years. I saw speedway bikes, racing two strokes, Vincents. Ariels and many others. There are some classic cars too. I even saw a German bike that I’d never heard of, a Bergmeister, and I thought I’d seen most of what there is to see. You are encouraged to wander around and look at your leisure. All the staff seem to take delight in their surroundings. I know that I had a great time in there. Vincent Rapide. Fastest production motorcycle in its day. One American’s attempt at creating his dream machine – or maybe a nightmare. 1954 Victoria Bergmeister – completely new to me. 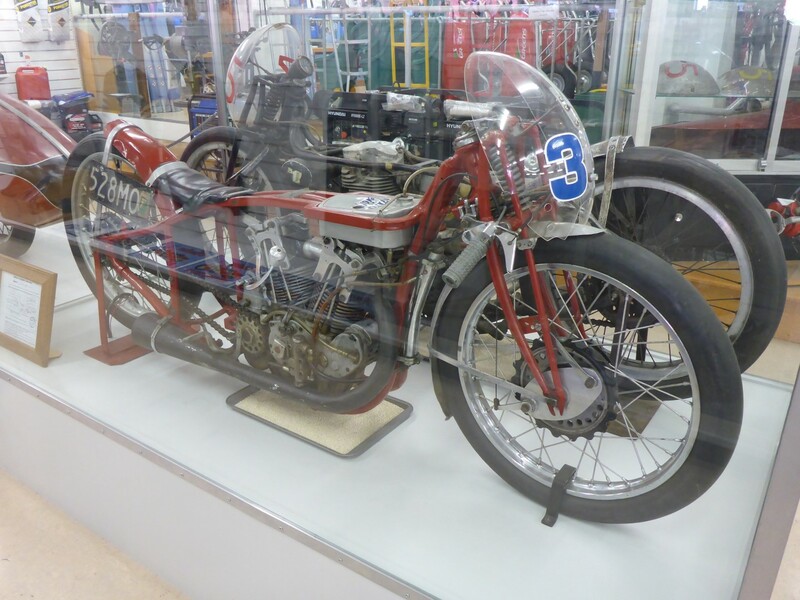 The town museum, visited next, also has a display dedicated to Burt along with some speedway bikes. Invercargill is clearly very proud of its record breaker. 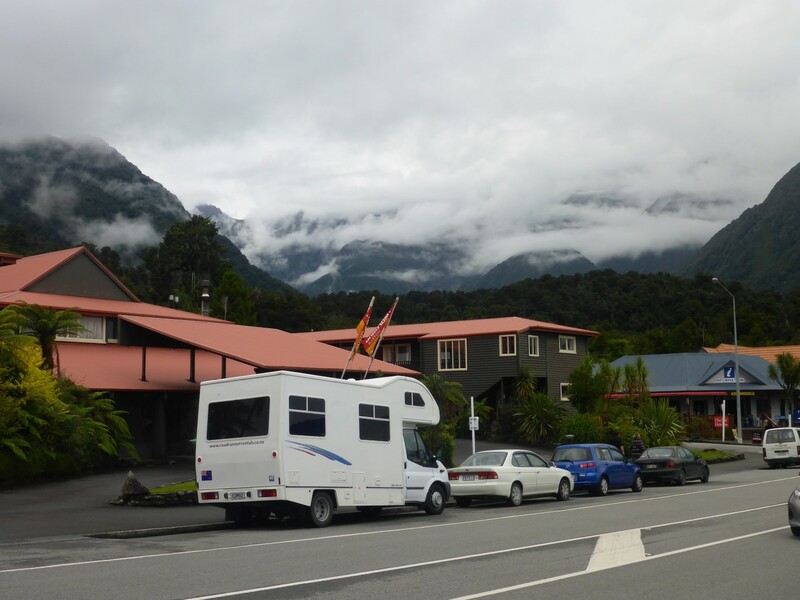 After a nice ride in the sunshine to Te Anau, and another chance meeting with the German cyclists, I got to my hostel and booked a day trip out to Milford Sound. 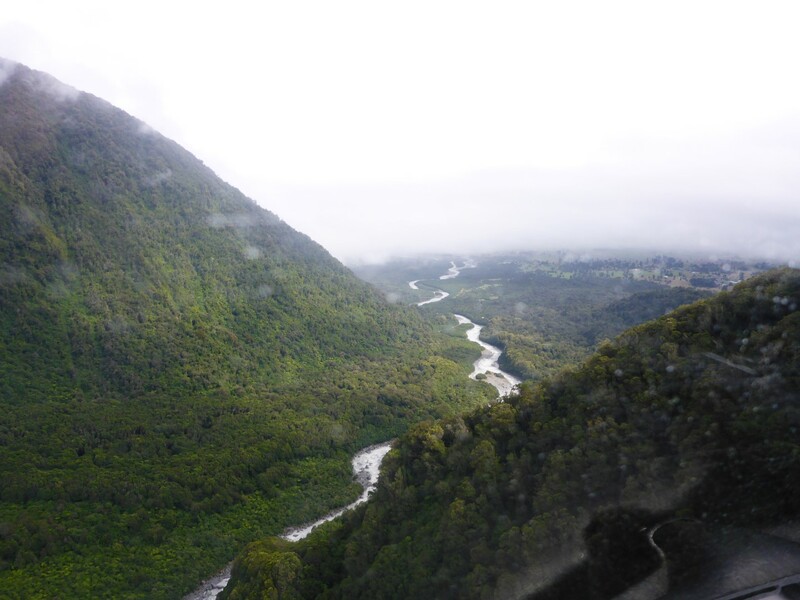 The southwest corner of the south island is called Fiordland National Park. The name aptly describes the terrain. This area has almost no roads and is mostly only accessible by sea. There are fiords all along the coast. Milford Sound is an exception as there is a road to it and the day trip includes a two hour drive to the landward end of the fiord and then a two hour boat trip, with lunch included. It was time to leave Doris behind and be a tourist. 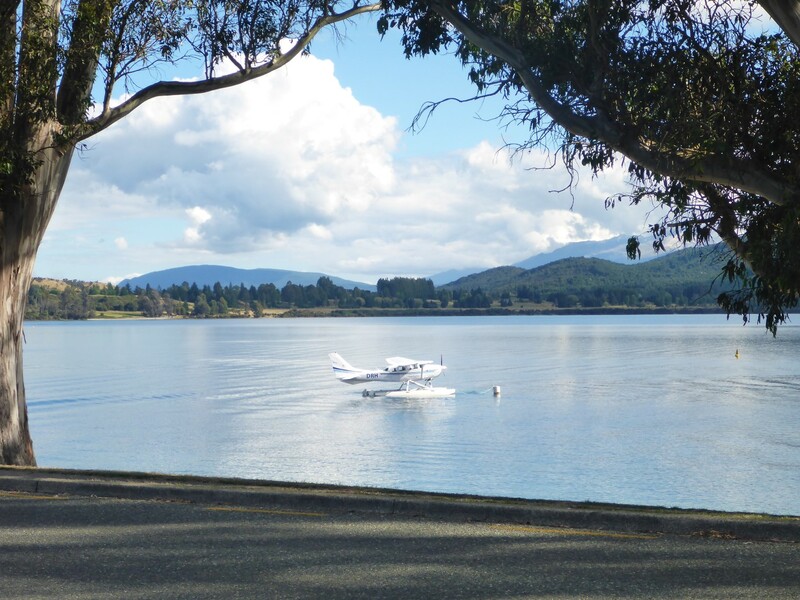 Lake Te Anau. Scenic flights available over the nearby mountains. The early start was more than made up for by the quality of our driver/guide. He used to work in conservation, before family life stopped him, and was consequently very knowledgeable about the area. He was quite scathing about the adverse impact of the industrial scale cattle farming that is becoming the norm in NZ. 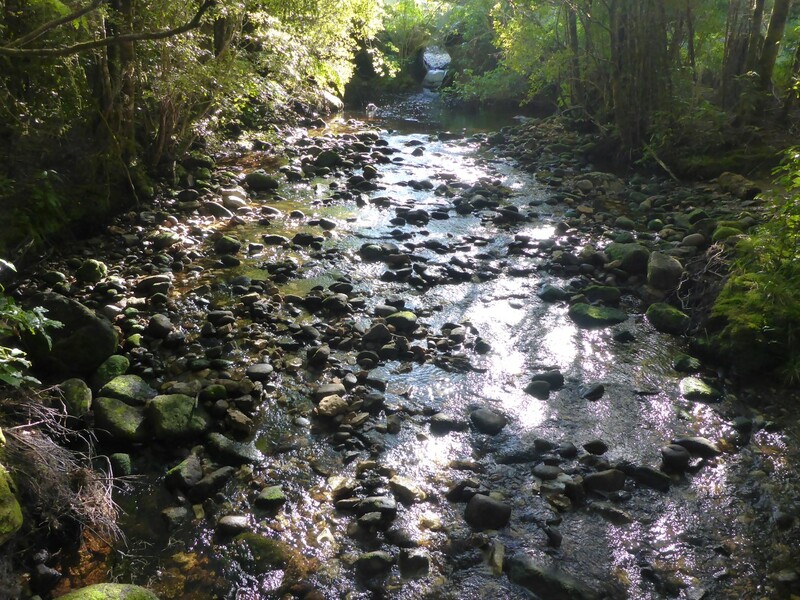 Rivers where people used to swim and fish now have ‘Keep Away’ notices on them, the effect of effluent in the water. The farms are supposed to follow environmental protection procedures but the local councils find themselves fighting a losing battle against giant foreign companies. Trying to control the effects of 5,000 cattle taking a crap is probably too big a task for anyone. Despite these huge herds, and the millions of sheep in NZ too, it is still the case that Kiwis pay more for their lamb and dairy products than do the foreign recipients of the country’s exports. 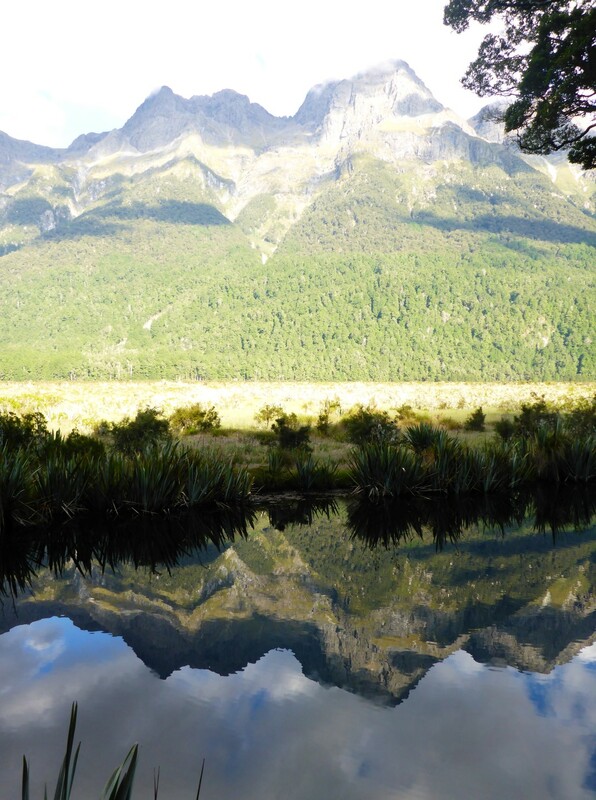 The mirror effect of Mirror Lakes. He told us all about the problems caused to native Kiwi fauna by the activities of introduced predators, something I’ve mentioned previously. A pair of stoats can generate up to seventy offspring in a good year, almost impossible to control. Many native species have disappeared or are under threat, especially the ground living birds. Conservationists fight a continual battle to prevent further loss. We stopped at Mirror Lakes, formed in an Oxbow section of the river. Being a calm day, the lakes lived up to their name and provided spooky reflections of the surrounding hills. 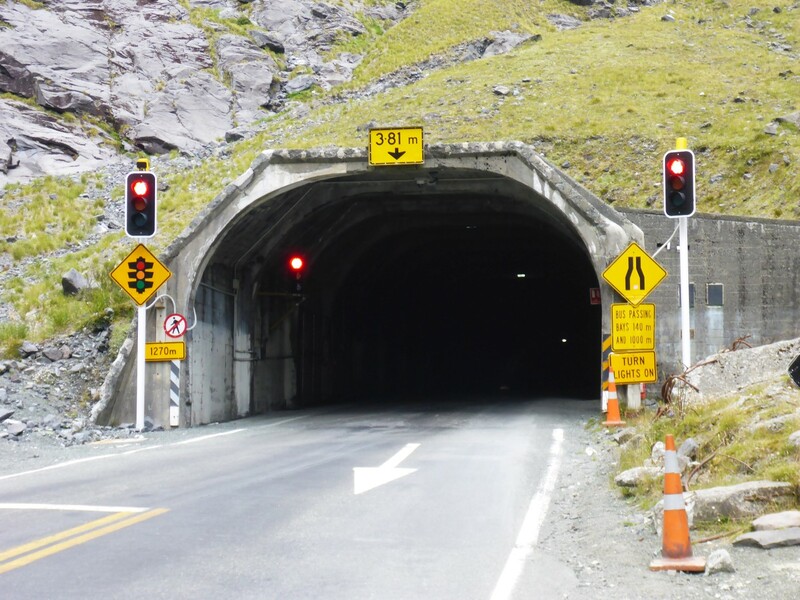 Talking of spooky, the drive through the Homer Tunnel matched that description and was fascinating too. Started in the 1930’s as a work generation scheme during the depression, it was finally opened in 1956. It was dug out by hand, with the aid of 5,000 tons of dynamite. Although there had long been a track over the mountains it had never been suitable for vehicles and the tunnel opened up the area to tourists. Several small villages were created for the workforce to live in, with small hydro-electric plants built to power them. The 1.5km tunnel is one way, has almost no lighting and an atmosphere that suited the misty mountains which it cuts through. Entrance to the spooky Homer Tunnel. Once down the hill on the other side we came to Milford Sound and caught our boat. The sound was discovered by a Welsh sea captain who was looking for shelter from a storm. He named it after his home port of Milford Haven although the name was changed later when the area was properly mapped. Lieutenant Cook missed it when he was mapping the coast as it was near invisible from the sea. It was explained to us that the name is, strictly speaking, incorrect. A ‘sound’ is a sea filled valley that has been carved out by a river. It should be described as a ‘fiord’ because it was formed by glacial action. 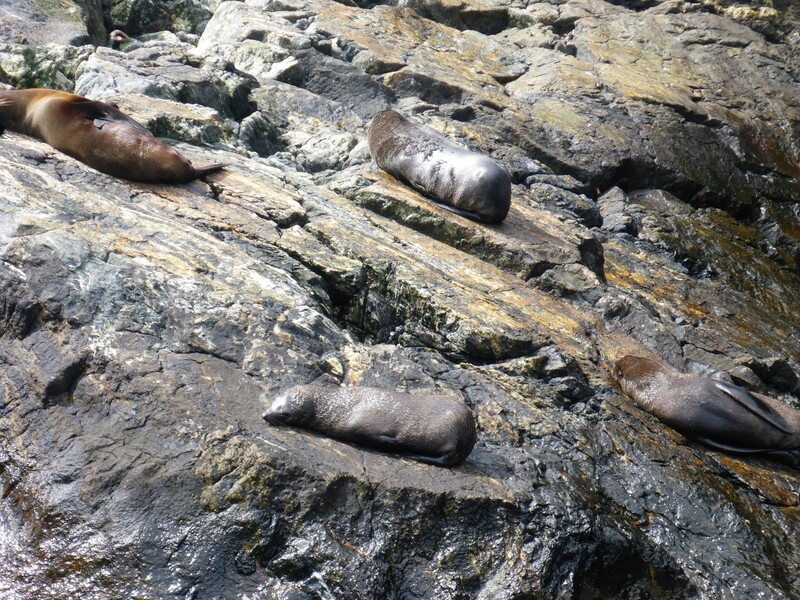 As we sailed down it we saw plenty of natural features such as waterfalls, seals and so on. The surrounding hills had been carved out by at least five different glaciers over the ages, as demonstrated by the different heights of the ledges in the rock. There were also ‘hanging valleys’, where an earlier glacier had been cut at right angles by a later one. Geology fascinates me so all this information was great to hear and the boat’s skipper certainly knew his stuff. There were a couple of very high waterfalls and we were told that after a period of rain there would be over one hundred as the water poured off the hills into the fiord. This area receives over six metres of rainfall per year. Six metres! To put that in perspective the wettest areas of Scotland have three metres. The reason is that the Southern Alps, which run down the length of the south island, are quite close to the west coast. The prevailing westerlies collect moisture from the Tasman Sea and when they hit the mountains, down comes the rain. 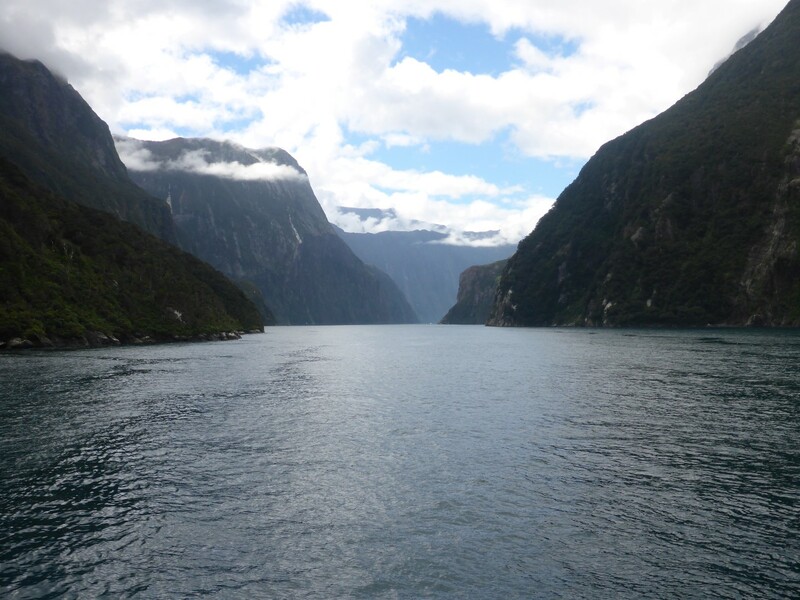 Another fiord factoid: Milford Sound is 300 metres at its deepest but is only 60 metres deep where it joins the sea. The reason is that as it reached the limit of its travel the glacier left piles of rock, which it had dragged down with it. The effect on marine life is strange. Because of the constant flow of fresh water into the fiord the top 10 metres of water is non saline and gets clouded with algae. 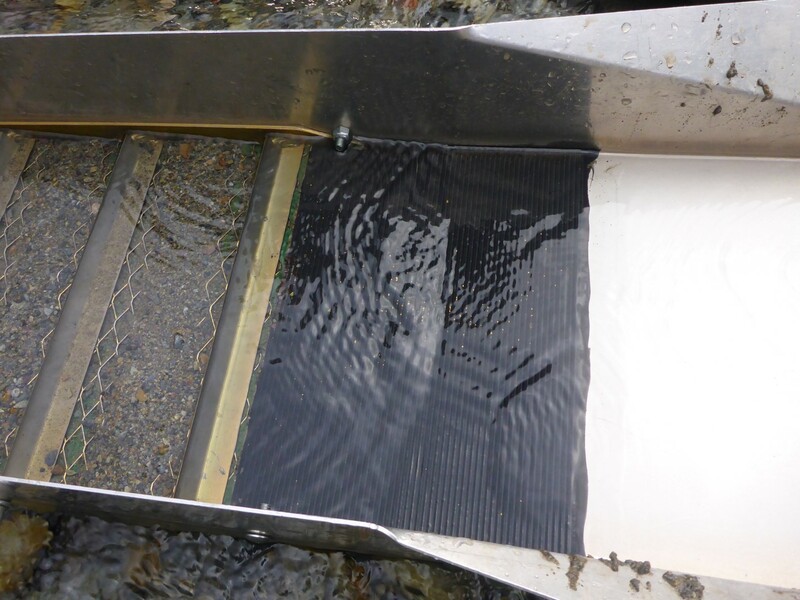 This prevents light getting through so within the fiord there are creatures living at 30 metres depth that would normally be found at 100 metres in open water. Luckily it was a dry day, if overcast, so we got nothing worse than a shower. But I can safely say that I learned a huge amount from the excellent guides and was delighted to have been shown around for a change. 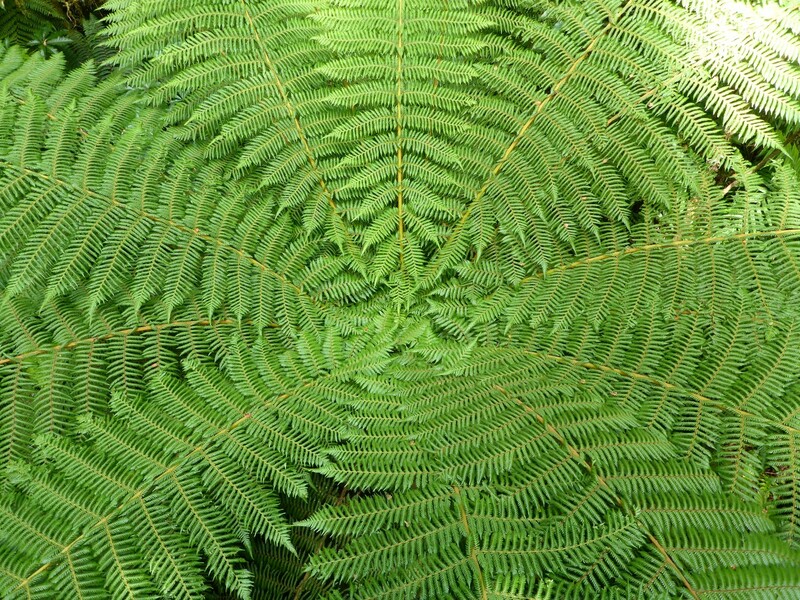 A Giant Fern frond,. One of nature’s amazing patterns. 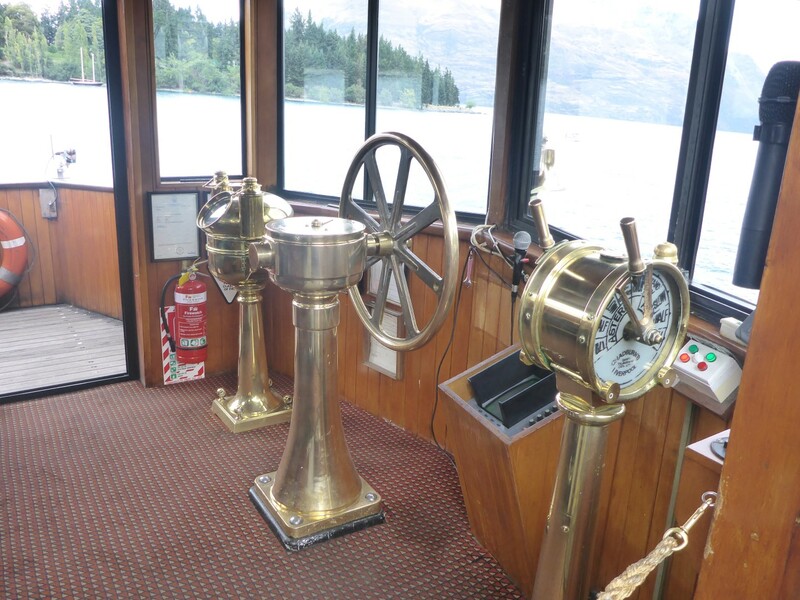 Moving on, the next destination was Queenstown, a touristy heaven, or tourist hell – depending on your point of view – which sits at the top of Lake Wakatipu When I saw it from across the bay I decided it was tourist hell. All I could see were grey, uniform, boxy tourist apartments climbing up the hillside. Once I was parked up by the lake I started to think better of it. TSS Earnshaw, coming in to dock. The town centre was nice enough in the sunshine and I booked a trip out on the lake on the TSS Earnshaw, a 100 year old steamship, offering passenger cruises. When I got on board I was very annoyed to find three motorbikes on there, being ferried across to Walter’s Peak farm. I was annoyed because as part of my journey from Invercargill I had wanted to ride a gravel trail that led to this farm. 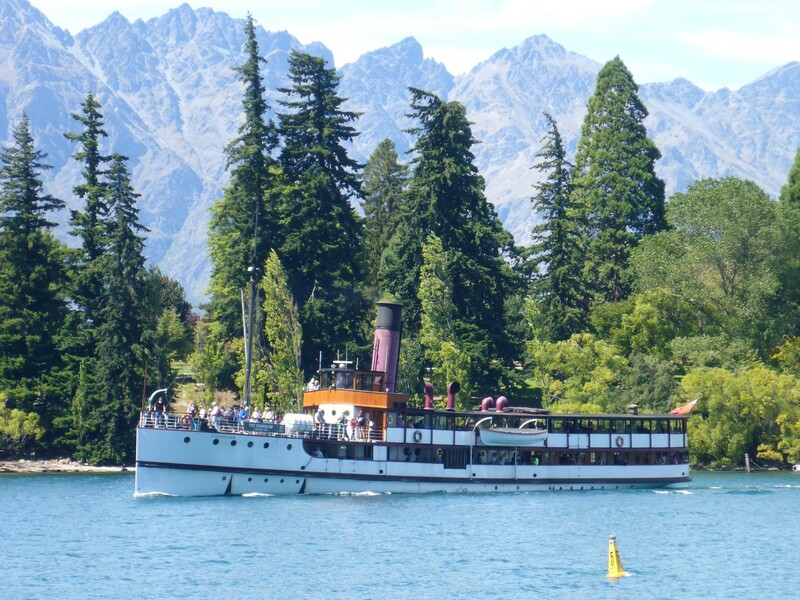 I had checked the website for the steamship but there was no mention of being able to ferry my bike across the lake from there to Queenstown. Frustrating! So instead I chatted to the riders about their plans and hoped they’d have a good time out there. Polished brass and hardwood bridge. TSS Earnshaw used to be a cargo ship serving the farms around the lake. 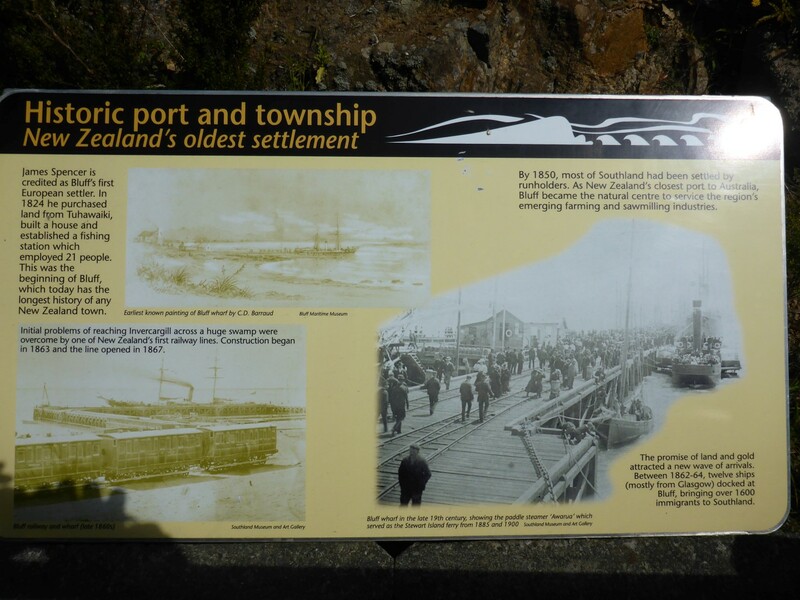 It had been built in Dunedin, broken down and transported to Queenstown by rail, then been rebuilt. Road building led to the demise of its trade so it was very beautifully converted to carry passengers. 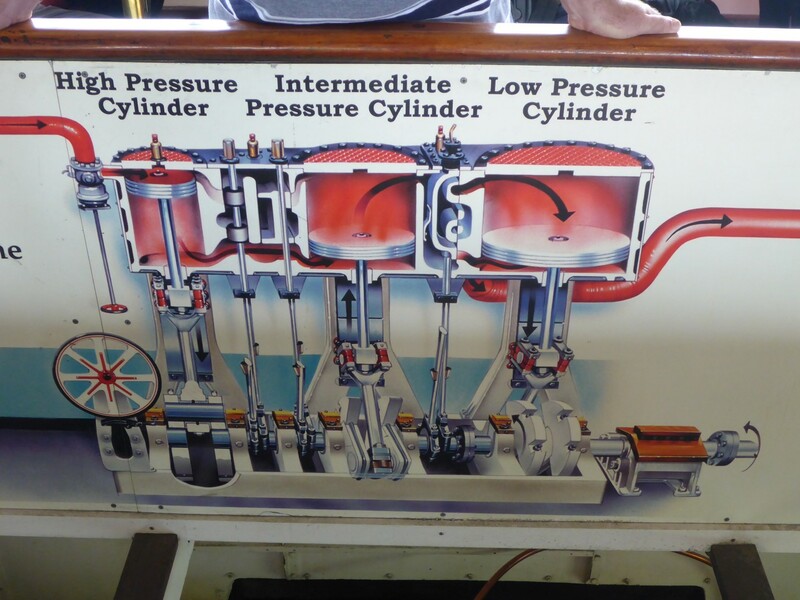 There is access to view the engine room and to watch the stokers at work. They have placed panels around the access stairs explaining how the engines work. Very appealing to the small boy that lurks inside many of us. Just in case you wondered how the engines work! Part of a fascinating display. All the hostels in Queenstown were full so I’d booked one in the nearby town of Wanaka, a nice ride through the hills to get there and well away from the hordes. On the way there, at a place called Cardrona Adventure Park, I saw a fence along the edge of a field with bras hanging off it, right along its length. Why? I have no idea! It’s just one of those things. It seems similar things happen at other places too. Quirky Kiwis having fun I suppose. At the hostel I was sharing accommodation with three elderly cyclists. A woman aged 66 years and two guys, 75 and 81. They were there to take part in an Iron Man competition. An Ironman Triathlon is one of a series of long-distance triathlon races organized by the World Triathlon Corporation (WTC) consisting of a 2.4-mile (3.86 km) swim, a 112-mile (180.25 km) bicycle ride and a marathon 26.2-mile (42.2 km) run, raced in that order and without a break. It is widely considered one of the most difficult one-day sporting events in the world. Most Ironman events have a strict time limit of 17 hours to complete the race. It typically starts at 7:00 a.m.; the mandatory swim cut off time is 9:20 a.m. (2 hours 20 minutes), the mandatory bike cut off time is 5:30 p.m. (8 hours 10 minutes), and the mandatory marathon cut off is midnight (6 hours 30 minutes). Any participant who manages to complete the triathlon within these timings becomes an Ironman. World record times are close to eight hours. The three of them looked bronzed and fit, although the older guy wasn’t competing, just acting as trainer. The other guy was the only one in his age range so all he needed to do was finish within the time limit and he’d be able to attend an international competition in Germany. His normal time was 13 hours, which seemed incredible to me. I think I’d need eight days to get through all that physical effort, never mind eight hours. I felt decidedly wimpy. 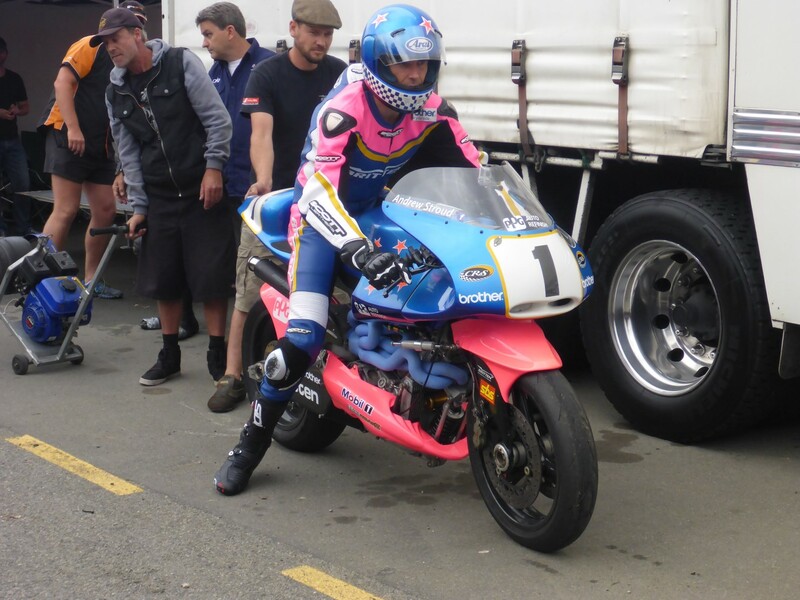 My planned route had originally been to head on over to the west coast but I’d decided to head back to Christchurch as there was a weekend of bike racing taking place at Ruapuna Raceway. It was a BEARS meeting and as it was the 20th anniversary of John Britten’s death from cancer, there were going to be several of his bikes there. More on Ruapuna later. The route was going to give me the opportunity to tackle a couple more gravel trails so I headed for Dansys pass, which began near the abandoned gold mining town of Kyeburn. At the foot of the pass is the Dansys Inn and just up past it is a small camping site, usefully free of charge. I met an Ozzie guy there, Barry, who was riding a friend’s Suzuki DR650. It seems that he borrows this bike whenever he visits NZ and his friend borrows one of his bikes whenever he visits Australia. A very handy reciprocal arrangement. We walked down to the inn for something to eat and met a group of Americans there who were on a ‘led and fed’ bike tour of NZ. Fly in, collect your bike and get shown around. Just right if you can only spare a couple of weeks, and something I’ve done, and enjoyed, myself. Back at the campsite we chatted to a guy who was digging for gold in the river. This was a hobby for him and he’d come up and stay a couple of days with his equipment and always went back with something to show for his efforts. 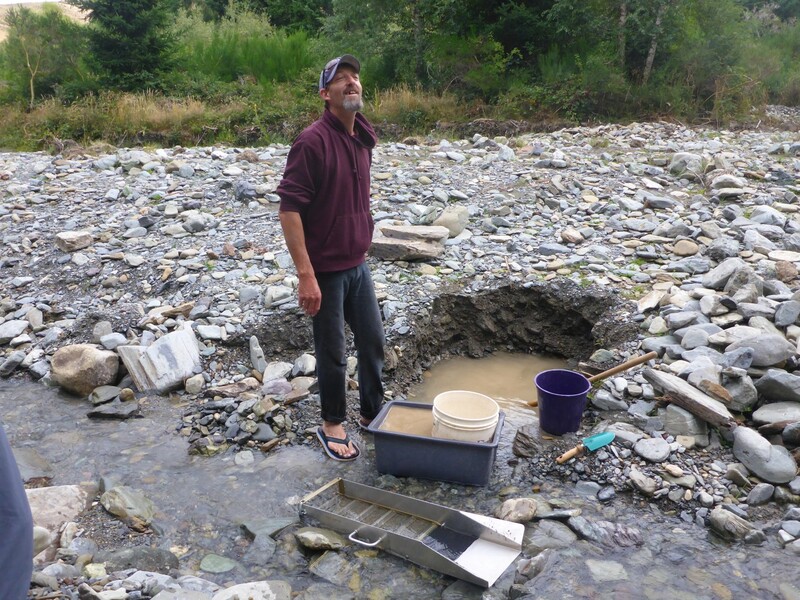 He’d dig out the earth from the bank, sieve out the large stones then run the mud through a sluice, collecting small flecks of gold in the process. There’s no money in it as the amount is too small, but he enjoys it anyway. Something to show for his efforts. Barry was heading to Ruapuna too so we decided to ride together for a couple of days. Next morning we headed up over the pass, a nice enough ride with good views. That got us near to another track which went up past Black Forest Station (sheep farm). Unfortunately it could only be ridden with permission and although we managed to find the phone number to ring, there was no answer. That was a shame as we knew it was a good one. In a café nearby we met a cycling couple, he Dutch, she American. He used to work for a large Suzuki dealer in Holland and was very familiar with my bike. I was pleased to hear him say that I’d chosen a very strong and robust bike and that I should just keep riding it until it started burning oil and not to interfere with it until then. He reckoned it should easily go round the clock before it gives any trouble. Good to hear it. Paul, having his own adventure. We ended up staying in the town of Geraldine that night. We had a stroke of luck at the only hostel in the town. They had two beds free because of a late cancellation. The third guy in our room was Paul, a recently retired policeman from Bath who had flown out to visit his son. He’d taken a six week holiday and his son had bought a bike for him to tour round on. He’ll then sell it for him afterwards. This kind of trip was a first for him and he said he was taking himself well out of his comfort zone but was having great fun. That’s good to hear and demonstrates the benefit of NZ’s system of vehicle registration, where personal injury insurance is paid for as part of the registration fee. It makes it so easy to fly in then buy or borrow a bike or car with minimum hassle. 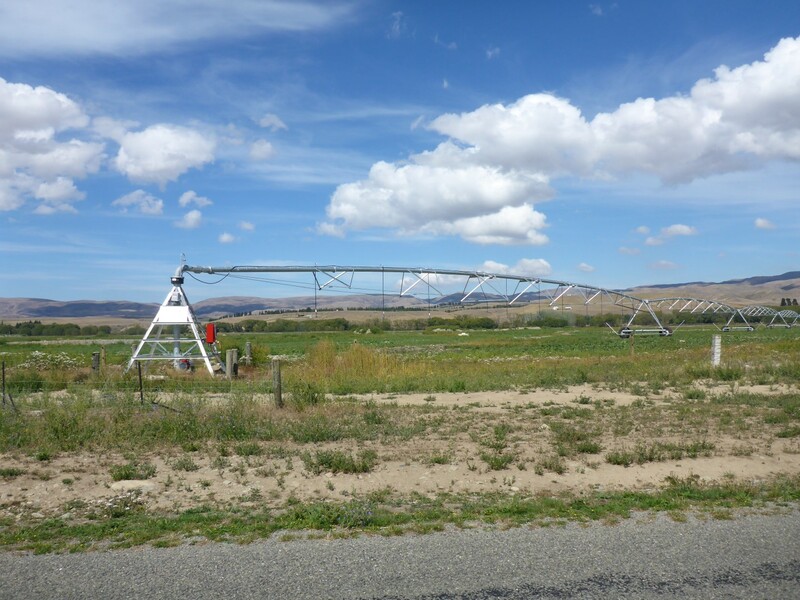 I saw plenty of these giant irrigation plants in the drought stricken Central Otago. We made it to Ruapuna next day and were lucky to find our way into the circuit via an unattended entrance, unintentionally of course. We rode round a perimeter track, past the official entrance, where we should have paid, and on into the paddock. We found enough space to pitch our tents and went to take a look around. BEARS stands for British, European and American Race Series and was set up deliberately to exclude Japanese bikes against which most others are simply not competitive. As much as participants may enjoy racing for its own sake, it gets to be very depressing if you can never win. Hence this series. The nature of it means that classic bikes can race against more modern machinery and the pits were full of old British iron as well as Ducatis, Moto Guzzis and Harleys. It also meant that the noise from the racing bikes would be music to the ears. I couldn’t begin to imagine the value of this collection of Brittens. 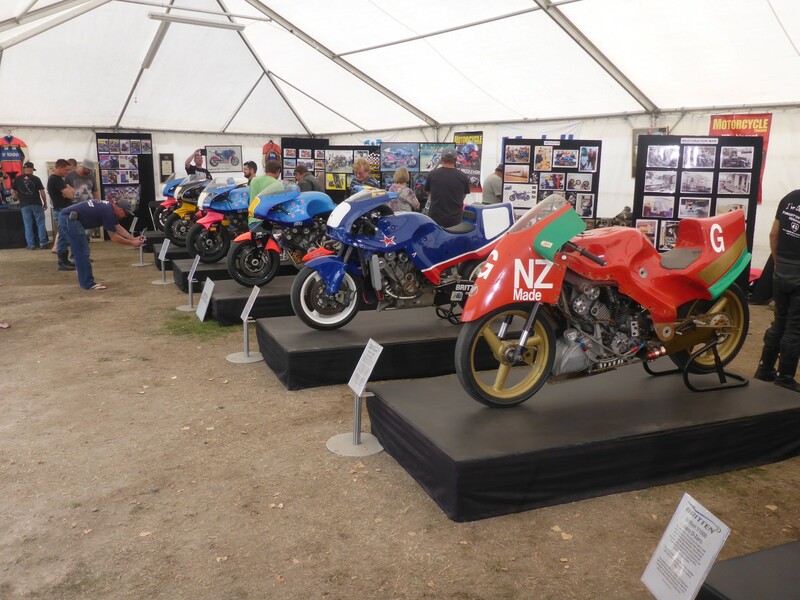 In the middle of the pits was a marquee with eight or nine Britten racers on display to an adoring Kiwi public. John Britten was an engineer with special talent, straight out of the mould of Kiwi engineering ingenuity. 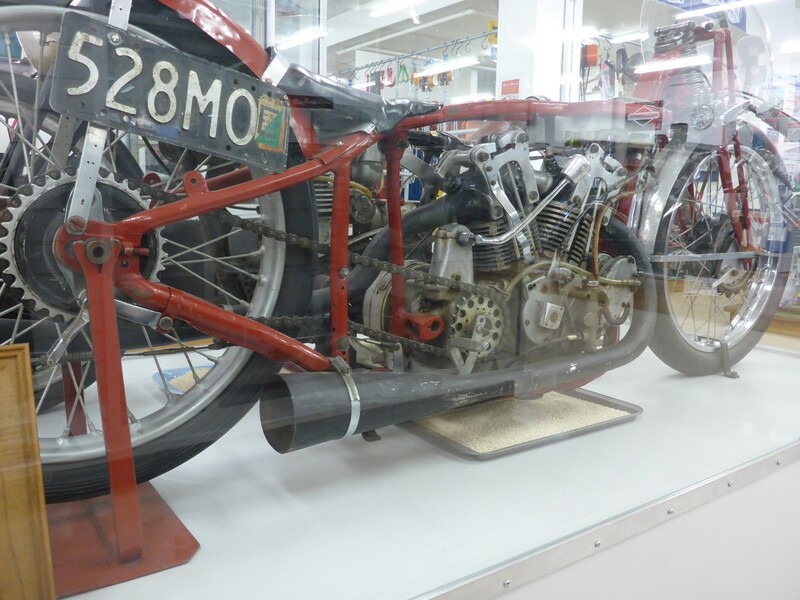 He developed a large V twin engine which became competitive enough to win races at the Isle of Man TT. He also developed a very special frame with innovative suspension systems front and rear. His untimely death from cancer cut short his career but he remains a hero in his native land. Andy Stroud, ready for his demo laps. Barry had met him and his sister at the Daytona races in the early 1990’s. He was amazed when she remembered him. I was introduced to her too and we had a great chat while we looked around the bikes. They would be out on the track later, on demonstration laps, one of the highlights of the weekend for most of the spectators. There were TV cameras aplenty as the event was newsworthy too. We saw some good racing as the day went by and were able to get right up next to the track at the pit wall. It was nice to see and hear the thunder of the big Harley and Moto Guzzi V-Twins as they flew – a relative term – down the straight. I’m sure the riders were enjoying themselves as mutch as we were. At the end of the day’s racing the Brittens came out for their demonstration laps, with plenty of enthusiastic support from the Kiwis for one of their favourite sons. 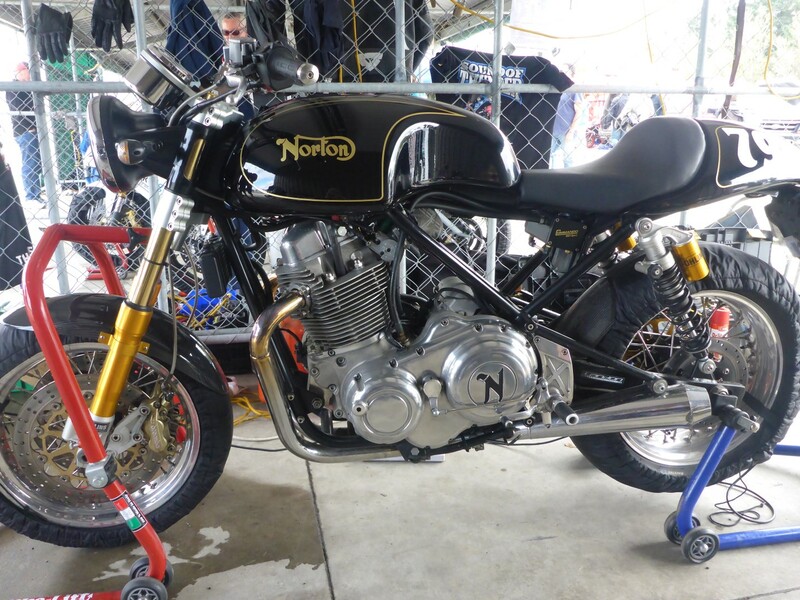 The latest incarnation of Norton Motorcycles, about to show its paces. One of the reasons for going to Ruapuna was to meet up with Steve, a British emigrée who I’d been introduced to on Facebook by one of my neighbours. As time went by I’d come to realise that I knew Steve anyway. He had worked for the AA in London before emigrating and our paths had crossed a couple of times. He knew my neighbour because they both rode Ducatis and he now spent some of his time working for SB Ducatis from Nelson, the town were he lives. His main job is with the AA in NZ. Steve had had to work that morning so he didn’t arrive until the racing had finished. No matter, as there was another day to go and plenty of action still to see. So we chatted and caught up on each other’s news. He loves life in NZ and wouldn’t consider returning, a common view amongst all those friends I’ve met with. After a while Steve took me to meet another Brit who was racing his Ducati that weekend. And this is where things got seriously weird. Steve introduced me to Guy, who introduced me to his friend and helper Bronwyn and his parrot, Reg, who goes everywhere with him. No, that’s not the weird part. As Guy was talking I very quickly realised that I recognised his very distinctive voice and accent. I asked him what his surname was and when he told me I realised that I knew him from when he also used to work for the AA. As we were talking Steve was looking at Guy, then at me, then back at Guy with a very puzzled expression. ‘I didn’t know you used to work for the AA, I only knew you as a customer in the Ducati dealer’ said Steve. And the weird part, to me at least, is that two people who emigrated from Britain never got around to asking each other what they used to do back at home. I know I would have done. So the rest of the weekend was spent enjoying the racing, the rain and the socialising. By the time Sunday evening came I had Guy’s address and a firm invitation to stay with him and Reg in Nelson when I reached there. 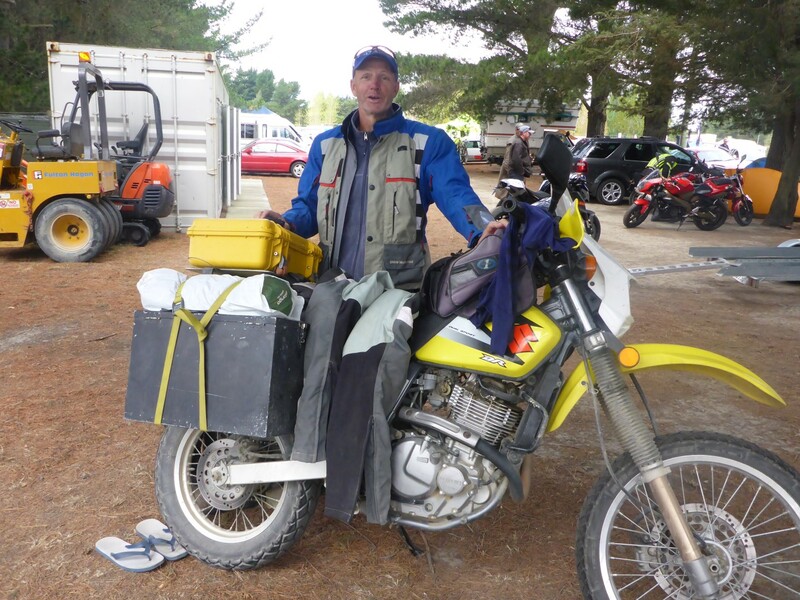 Barry, from Byron Bay in Australia, with his borrowed Suzuki DR650. Something nice that happened on Sunday morning was a conversation I had with a British immigrant who saw my number plate and came over for a chat. 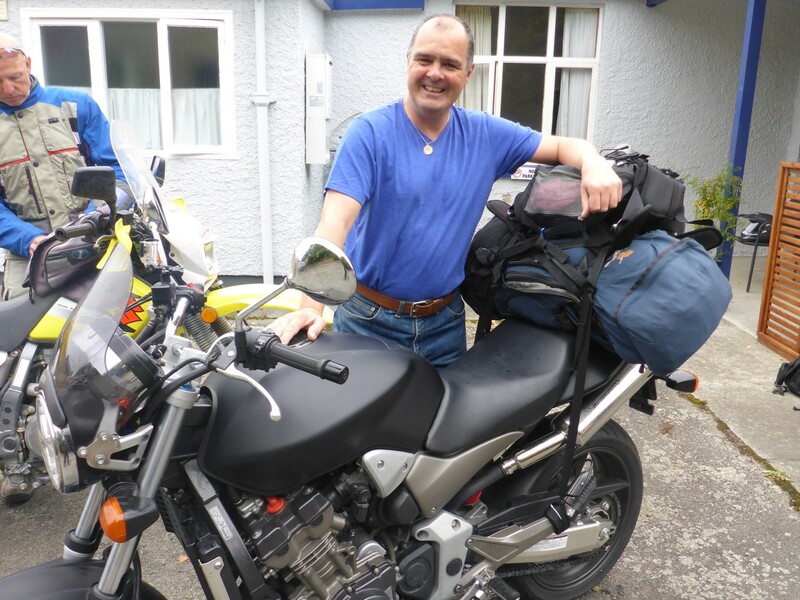 A few years ago he had planned to undertake a similar journey to mine with a friend but he’d died quite suddenly of cancer. He no longer had the heart to do it so he sold the bike he’d planned to use and given up on the idea. Barry and I were encouraging him to give it another go and I remembered that I’d been given a business card by a British guy I’d met in Auckland whose business was transporting bikes to and from the UK for people like him. So I gave him the card. He asked me if I believed in Karma and I said I did and that by accepting it he’d just taken the first step on his journey. I really hope I’m right. Barry and I parted company on Sunday afternoon. He had to head back to his friend’s to return the bike. Back in Australia he was going to be preparing a trip to Russia, via Japan, that he’s planning to make with two friends. He invited me to stay with him, when I get there. He lives not too far from Brisbane, my entry point into the country. I felt sure I’d be able to give him some pointers, based on my own experience. I then headed into Christchurch, having been invited to stay with Chris once more. Second cousins Bob and Betty. The next couple of days were spent visiting my cousins once more and making plans for the transportation of my bike to Australia. As well as deciding on a shipping company, I had to find someone to crate up the bike and also to get my Carnet extended. I had spoken to a company called Go Logistics about the shipping, and they seemed very helpful, especially with the speed and clarity of their quotes. I had yet to decide whether to ship to Melbourne, Sydney or Brisbane. My eventual decision to ship to Brisbane was based partly on the poor weather that would have arrived in Sydney and Melbourne by May, but mostly because I had a friend in England who’s brother lived in Brisbane and he was keen to help me. Never look a gift horse in the mouth. Unrelated to the text, but what does that matter? 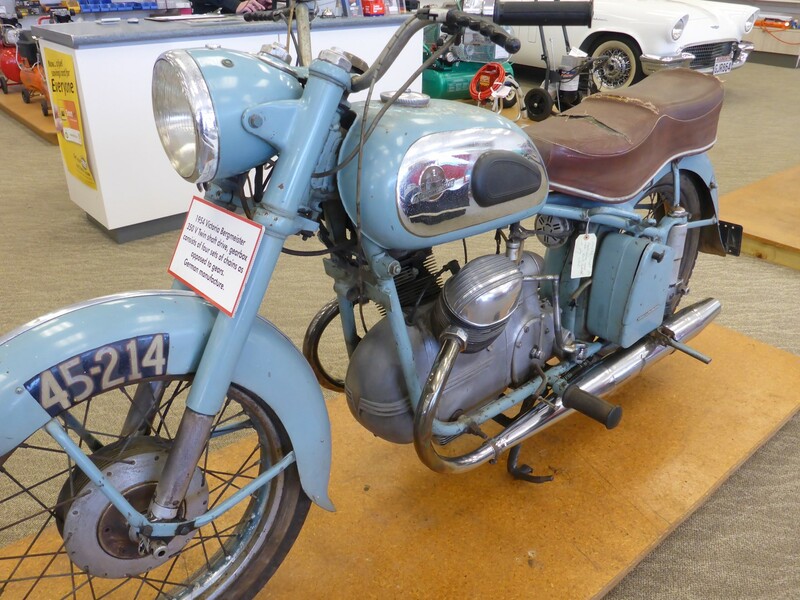 A very lovely Matchless G50. Enquiries with a couple of packing companies suggested that crating up the bike was going to be expensive, far more so than it was in Korea. The shipping company suggested I contact some motorcycle dealers to see if I get obtain one of the frames that new bikes arrived on. Something to think about. The problem with my Carnet was that it expired on 15th April, just about the time when my bike would be in the hands of the shippers. I made enquiries with the RAC, who issue them in the UK, to see what my choices were. It seemed I could get a new one issued and then sent put to me in NZ or to go to the AANZ and get the one I had extended. This seemed far easier and was what I did in the end. Carnets can be troublesome documents and they have to be right so as to avoid problems with customs departments – not the kind of people you want to upset. By extending it for 12 months I was going to make leaving NZ and entering Australia far easier. I spent some time socialising with Chris, Lisa and Ryan but eventually it was time to leave for the west coast once more, and pick up where I left off before Ruapuna Raceway tempted me off course. I was delighted to see that my route took me past the gravel trail though Black Forest Station once more so I rang them up for permission and was given the gate code and a reminder to put my $20 fee in the honesty box. The track was really enjoyable. Twisty, hilly and difficult in places, with some fords to cross too. 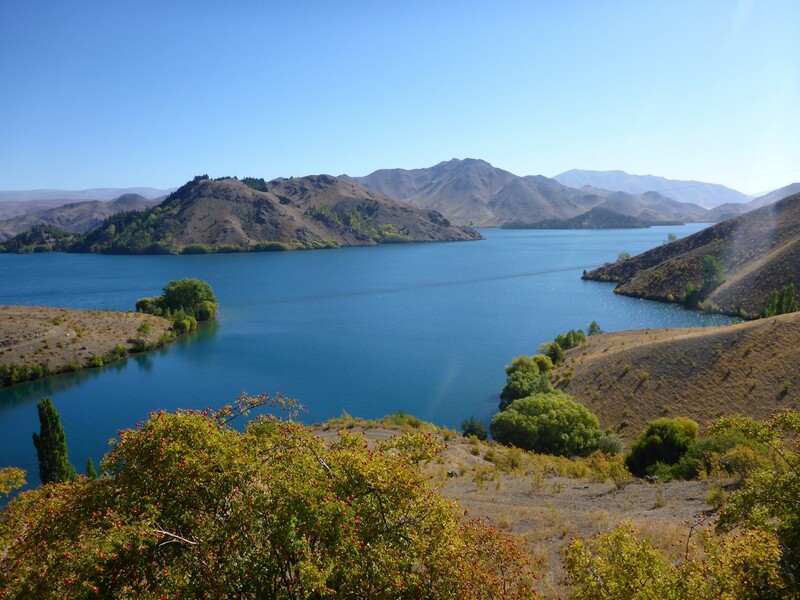 One of the best things were the views out across Lake Benmore’s deep blue waters and the dam and hydro electric plant, where the trail ended. A prime example of NZ’s effective use of its natural resources. Hydro-electric plant at the head of the lake. 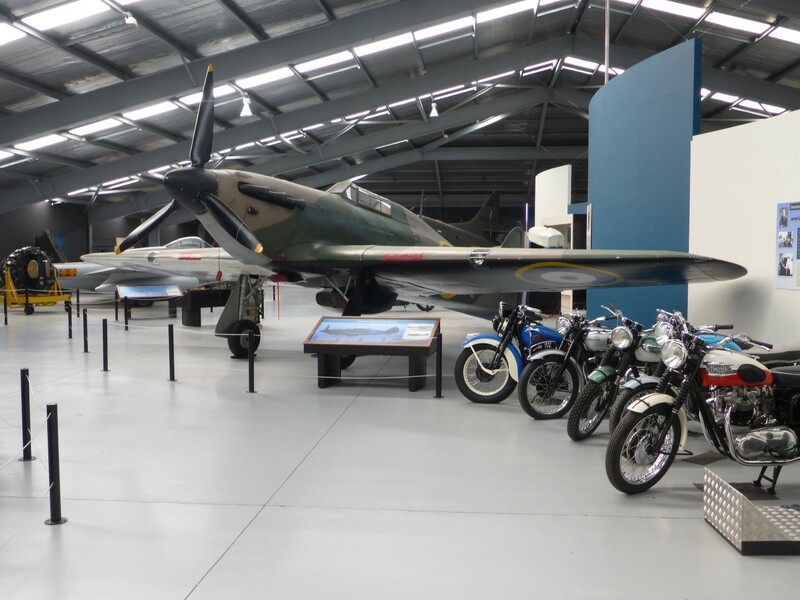 I came across a museum called Warbirds and Wheels which turned out to be a fabulous place, full of war planes, old cars and a few bikes thrown in for good measure. Warbirds is a name given to military planes that are now in the hands of private collectors. Originating in America, the idea came to NZ after an air display in 1988 which proved so popular that it grew into a biennial event. 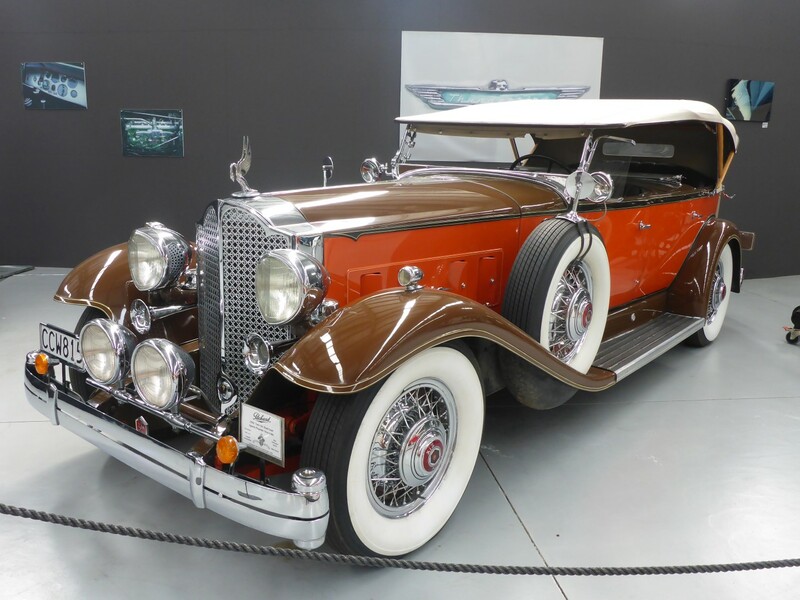 The museum grew from that and as well as a variety of iconic aircraft it also has a stunning collection of old American cars such as Packards, Lincolns, De Suizas, Fords and so on. All of the exhibits are beautifully restored and along side them are some displays dedicated to Kiwi engineers and other important people. The café attached to the museum is set out and decorated like an American Diner, with usefully reasonable prices and free wi-fi too. I’ve been constantly amazed and impressed by Kiwis’ love of classic vehicles and their ability to present them to the public so well. 1932 Packard Sports Phaeton. One of the many stunning exhibits. 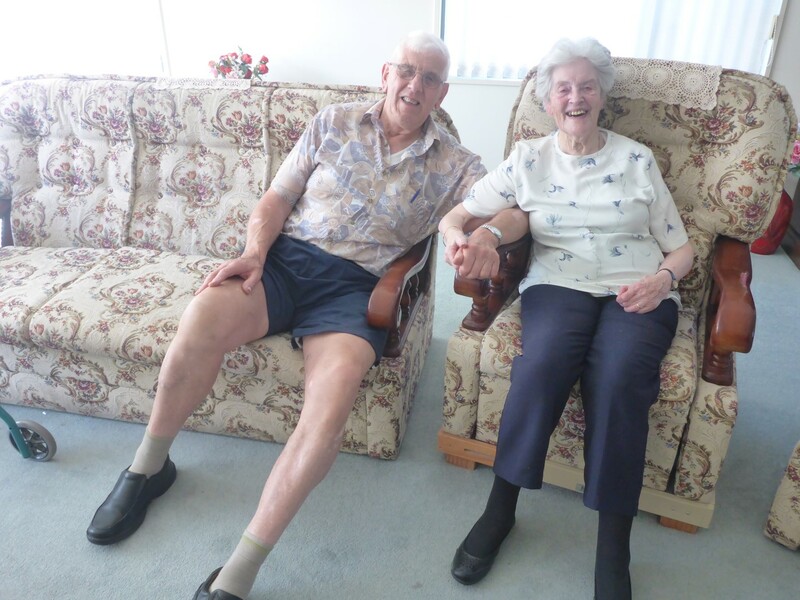 I was due to stay with some friends of Maureen (Dunedin) called Mauryne and Bob. They lived right out on the west coast at Hannah’s Clearing and the ride there took me through some great scenery including the Haast Pass, one of four that cross the Southern Alps. I met them down at Jackson’s Bay, which is about as far south as the road goes down the coast before the rainforest takes over the land. The Craypot restaurant supplied a very nice meal of fresh grilled turbot and while we ate we watched a guy across the road struggling to load a kayak onto the roof of a car. We later discovered he’d paddled his way to Jackson Bay from Christchurch, taking six weeks to do it. By my reckoning that’s a journey of 1500kms or more. He must have arms like Popeye on steroids! Mauryne, Bob and his brother Bill had been sea fishing from their boat every day that week, taking part in a NZ wide competition. They did it for fun although many others take it very seriously. After rising a bit late next morning I learnt that Bob and Bill had been butchering a deer that Bill had shot, before dividing it up for freezing. Life in the country folks! 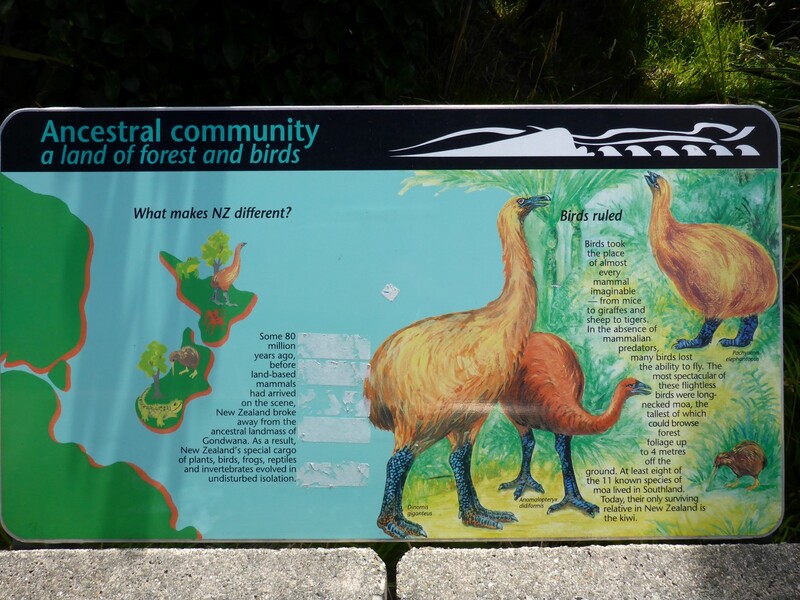 I called in at the museum at the DOC information centre in Haast and saw a very interesting display about the local flora and fauna. The whole area is a World Heritage Site and contains large areas of native forest and wetlands. There were displays describing how settlers came to the area by sea and really struggled against the rain, rivers and floods. Many were Polish city dwellers who had no idea of what they were doing but had been placed there by settlement companies. They mostly failed although eventually enough cattle farms took hold to develop the area. Communication was entirely by sea until a pack horse trail was created over the Haast Pass, eventually becoming a road. Taming these remote areas was tough going. Riding up the coast road, it was easy to see the effects of the area’s heavy rainfall. There were many rivers and the vegetation was lush and mostly tropical looking. The mountains that rose up inland were shrouded in cloud, not boding too well for the plans I had in mind. 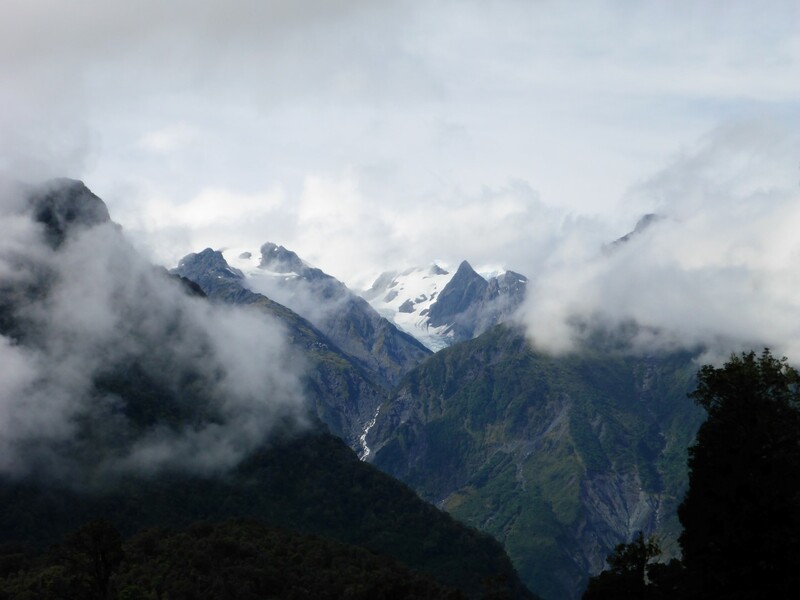 I had booked into a hostel at Fox Glacier which, along with Franz Joseph Glacier, comes down to the coast from the heights of the Southern Alps. The towns named after the glaciers exist pretty much just for tourists and are the stepping off point for walks and tours up to and onto the glaciers. As soon as I arrived I booked a heli-hike for he next morning. Expensive at £200, I thought it would be worth the money. 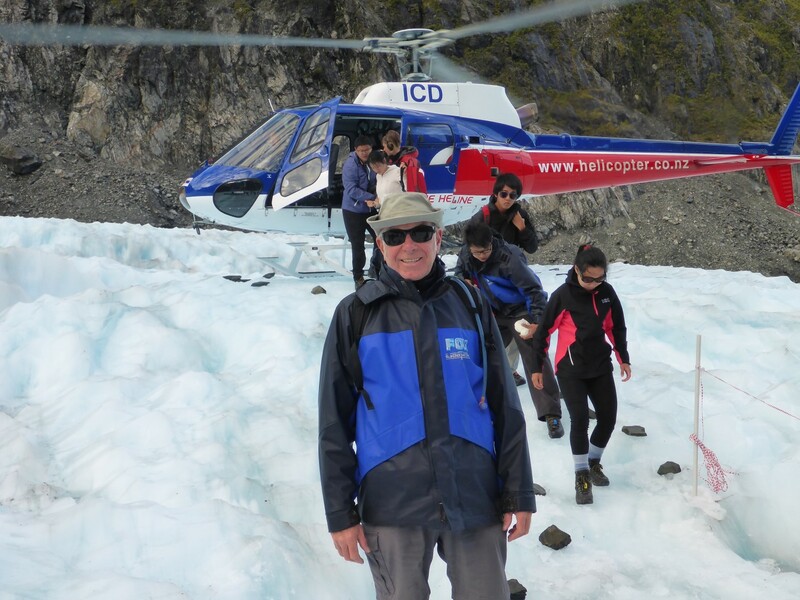 Going up in a helicopter and walking on a glacier were two things I’d never done before. It was to be two days and four cancelled bookings before I’d achieve them. It was the morning of the third day before the clouds over the mountains cleared enough to allow the flights. But it was worth the wait! Going up in a helicopter is magical. Smooth and swift, we seemed to be several hundred feet up in the air almost as soon as the door was closed. Incredible. Finally, I’m up on the glacier. We landed on the glacier, where other guides had been out since daylight cutting steps in the ice for us to walk along. 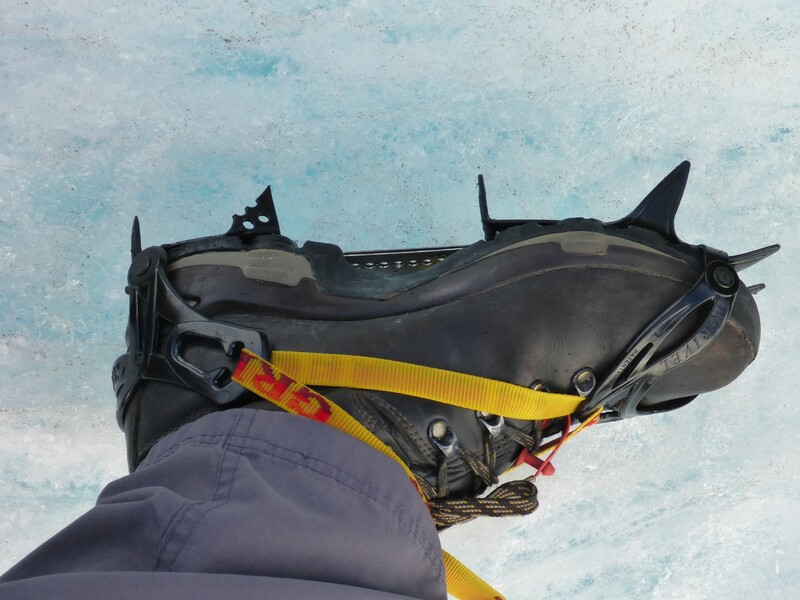 We had been issued with warm clothing, boots and, most importantly, crampons. Until they were in place landing on our backsides was an imminent danger. 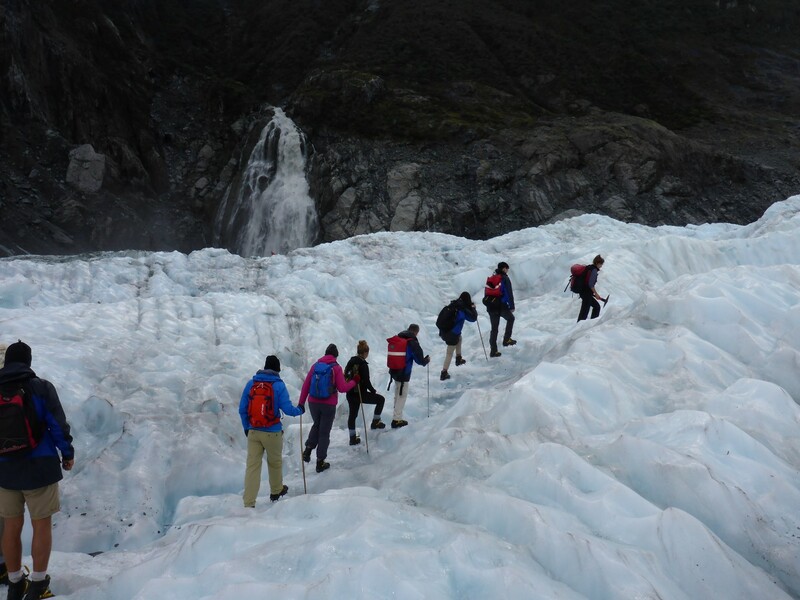 We were led across the ice and Kat, our guide, explained the many features of glacier ‘life’. A pressure arch, with blue ice inside and dust that’s been blown in. Glacier walking tour, with Victoria Waterfall in the background. Rainfall up on the mountain tops is eleven metres per year but it mostly falls as snow. There is a lake at the top of the glacier called a Nevé from which frozen water supplies the downward flow. This is at a rate of three metres per day but slows on the flat parts to one metre per day. The result is a jumbled mess of ice, pools of melted water and pressure arches, where the flatter ice has been pushed up by the ice coming in behind. Some of the ice is blue in colour although I don’t know why. There is grey/brown dust on it from a recent rockslide and the reddish tinge on some parts of it is sand blown across from Australia. 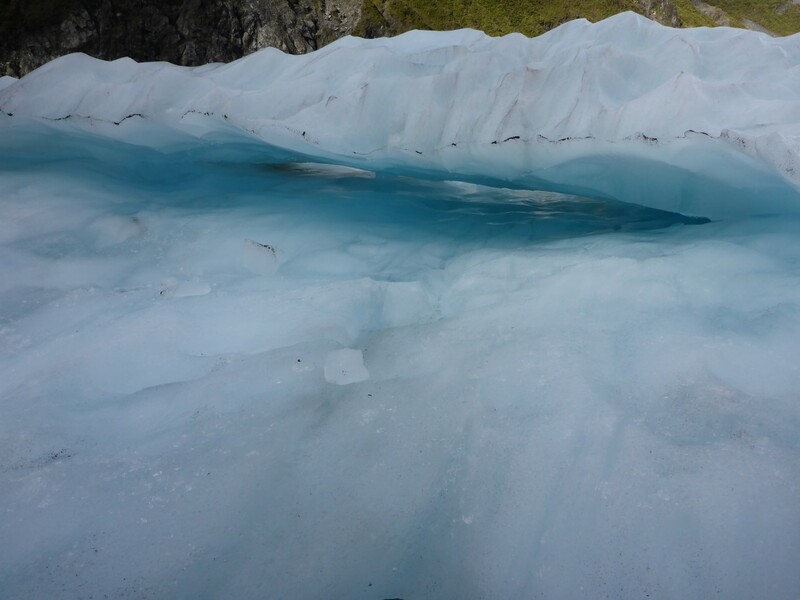 The ice is about 150 metres thick and its movement is partly lubricated by the water from a waterfall to one side, which runs underneath it. 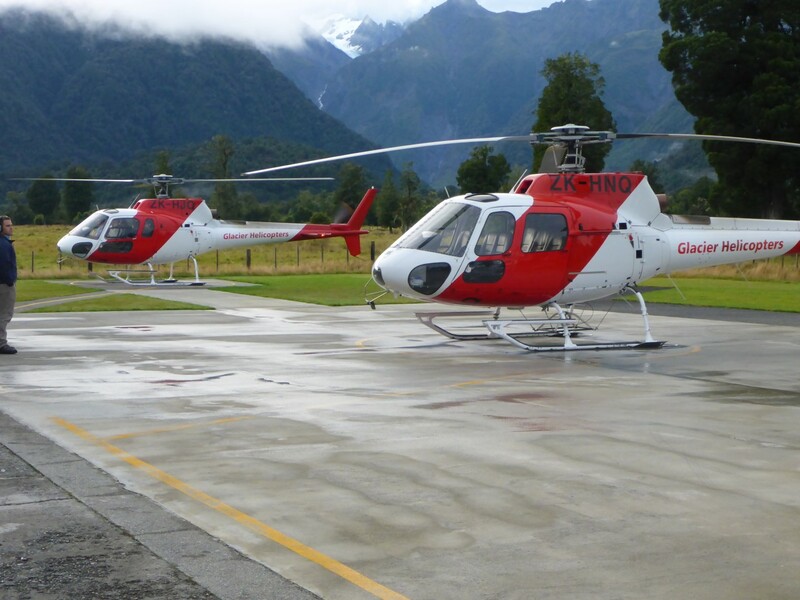 Near the top of Fox Glacier is a smaller, hanging glacier called Jewel and behind that is a nother one called Gem. There are over 3,000 glaciers in NZ and Fox is the third largest. Franz Joseph, a few kilometres up the road is the fifth. Both have receded significantly over the last twenty years, global warming at work. All good things come to an end and eventually we had to leave. We were due to fly up above the glacier, where we’d have been able to see others nearby, but the weather was closing in. Later flights were cancelled so I suppose we were lucky to get up there at all. I was absolutely fascinated by the whole trip and particularly liked the juxtaposition of modern technology enabling us to observe something that has been taking place for millennia. 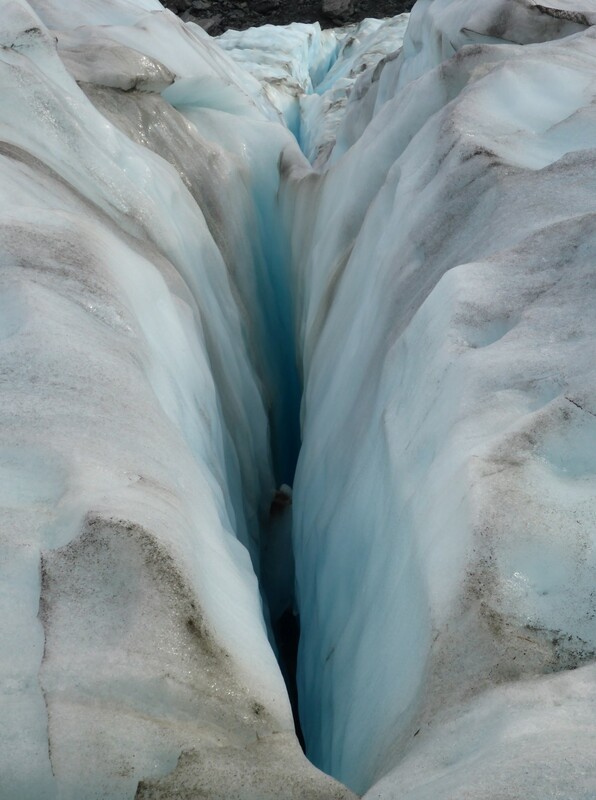 Glacier melt works its way down to the sea. No more flights today as the weather closes in over the mountains. It turned out that they used to own the petrol station in Fox Glacier and Collin used to be a glacier guide, so we had a good chat about my experiences up there. He’s a mechanic now but had the time to show me around the local area and the old gold diggings. This industry was just as effective as open cast coal mining at changing landscapes. Old hills literally washed away by giant sluice guns, new ones thrown up from the spoil. The old workings have been reclaimed by nature now so a stranger wouldn’t know what went on. There are still gold extraction works there now but the companies are forced to reinstate the land afterwards. Life of Man. 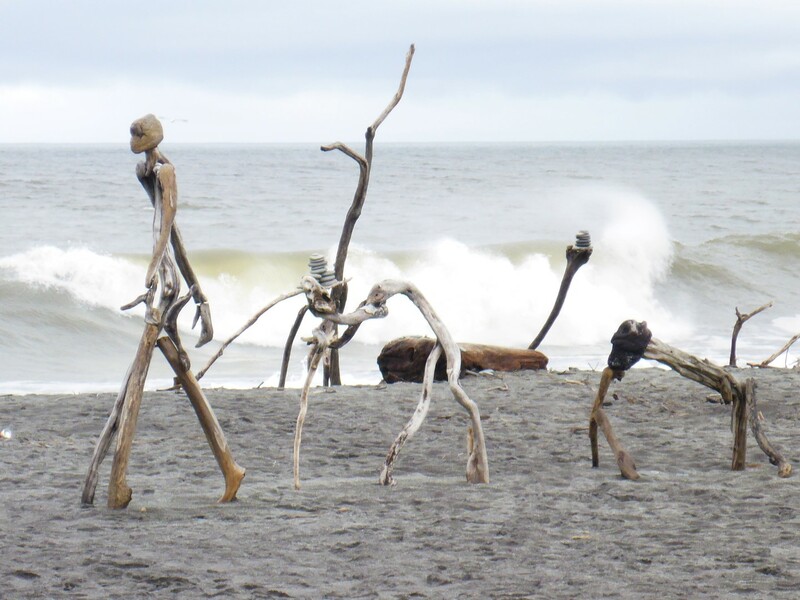 One of the exhibits in the annual Hokitika driftwood sculpture competition. My last destination on this coast was Westport, after which the road north is a dead end. 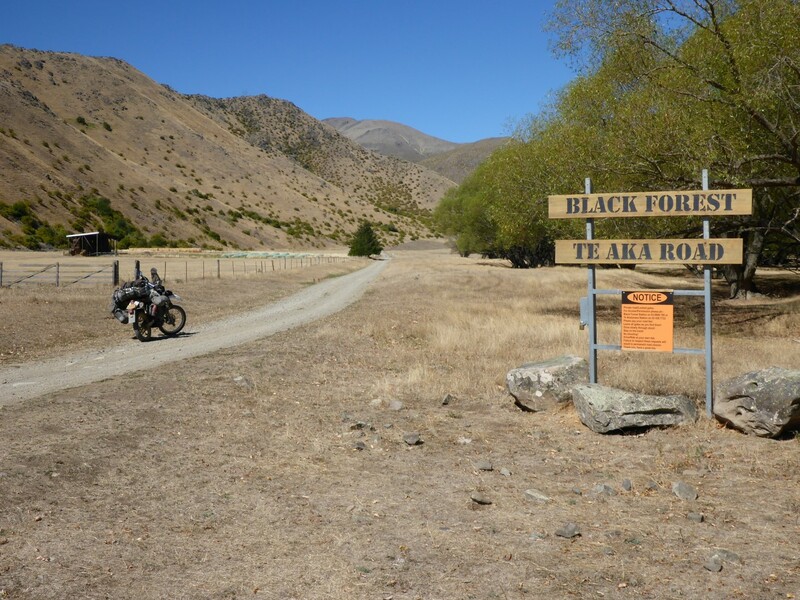 Even so, I still took a great ride out one day, up to the town of Karamea, from where there is a very nice trail out into the woods to some limestone caves that were used in Lord of the Rings. The road up from Westport was a great ride, hilly and twisty, as was the trail itself. Good fun once the afternoon sun had replaced the heavy morning rain. 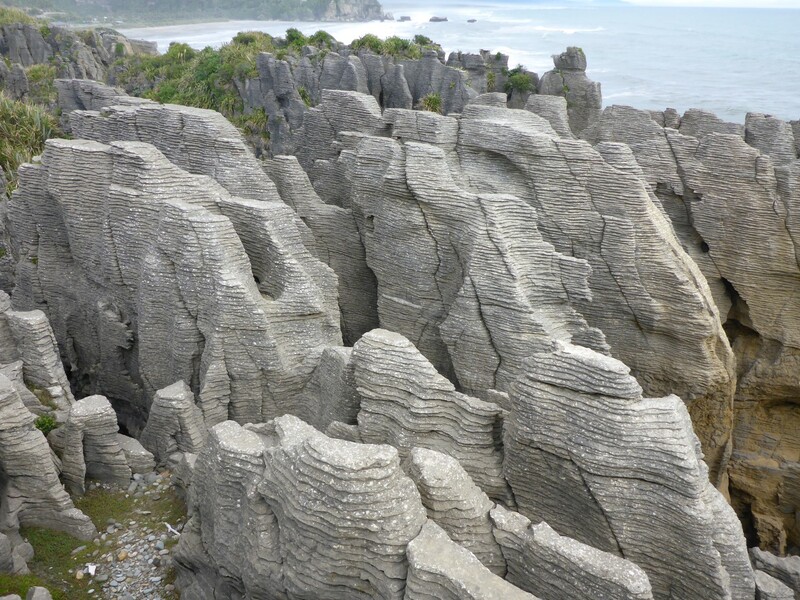 Strange rock formations on the Westland coast. At this point it’s worth describing one of NZ’s very few drawbacks, at least as far as I’m concerned, and that is in getting a decent cup of coffee. If you’re a coffee aficionado you’d love the place. You can get an espresso, a long black, latté, flat white, cappuccino, mocha or whatever other fancy pants version you feel like. But ask for an ordinary coffee, with milk, and all you’ll get is a blank look. A case in point. I stopped at the only café in Karamea and asked for an Americano with some milk. After a brief discussion as to what an Americano was, I sat down and was delivered half a cup of very hot black coffee and a jug of ice cold water. Massive fail, and at that point I completely gave up on New Zealand with regard to ever getting a coffee to my taste! Woodland stream up near Karamea. Another night and morning of heavy rain and high winds led to some inconvenient news. An Aussie couple I’d been chatting to (home stay now lined up for when I get to their part of the country) had been out in the town and had learned that the road to Nelson, my next destination, had suffered a landslide and been closed at Bullers Gorge. The alternative route, back south to Greymouth before taking another road north again, would be 200kms and two and a half hours extra. The traffic info website said there would be an update at 13.00. At 13.00 that became 15.00. It had stopped raining, time to go. Outside of town, at the junction where SH6 split to go east or south, the road was still closed and the road crew confirmed it would be at least 15.00 before it opened. Some people were parked up waiting but that’s not my style. I prefer to be moving and progressing, even if it’s the long way round, rather than sitting still not knowing. Of course, while I was riding all those extra kilometres I couldn’t help wondering whether my decision was the right one. When I got back on route the road was still closed. Good decision on my part. 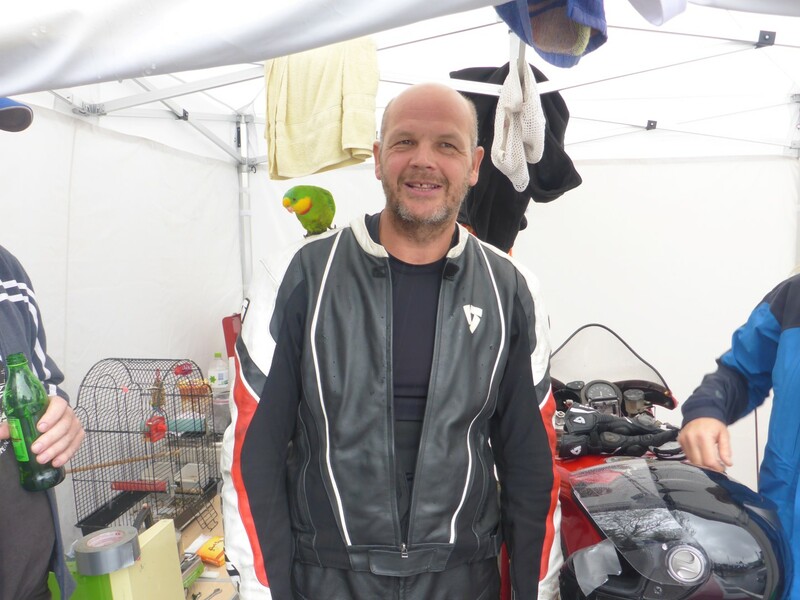 I had been invited to stay with Guy and I reached there at 19.00, let myself in with the spare key as Guy was out, settled down and began to make friends with Reg, the parrot.